Delhi Doctors Strike- Why? WHY NOT? Over 20,000 resident doctors are at strike in Delhi since yesterday. The strike, which is going on through more than 20 government hospitals of Delhi, put the entire healthcare at a full halt. Patients were sent back, surgeries were cancelled and only basic emergencies were being catered to. Safety- Doctors want security and posting of guards for their protection at the hospital. Enough of unnecessary thrashing, they say. Reasonable demand, we believe. Duty Hours- Its not a new fact that doctors are overworked. But the numbers of hours put in by doctors at over-burdened government hospitals is just inhuman. All they want is fixed duty hours, if not to have a personal life, then maybe to catch up on the required sleep in a day. More than reasonable. Safe Water- that’s a basic necessity, Isn’t It? Availability of Medicines and surgical items- You know, as these are doctors, they work in hospitals….they need these items, don’t they? 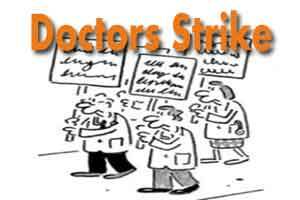 This is not the first time in history of Indian medical sector, that doctors have gone on strike. This is not the first time that Indian doctors have made these very demands. Well, this is not the first time THIS YEAR that doctors have gone on strike with these very demands. Same demands were made in Febraury this year, government had accepted it, but yet nothing was done. Its no wonder that, when government accepted the demands yesterday, the doctor’s did not budge. They plan to continue the strike till the demands are met in action, not just in words. The meeting Of FORDA, the banner association calling the strike will be help today in the evening to discuss the reply of the government. The government in the mean time has imposed Essential Services Maintenance Act (ESMA) Act on resident doctors on strike. 0 comment(s) on Delhi Doctors Strike- Why? WHY NOT?